usually a boy who assists back tenter (paper staining) or machine printer (paper staining) (536) q.v. stands at back, i.e., delivery end, of wallpaper printing machine; fills colour boxes with distemper paint from a can; helps machine printer (wallpaper) (536) q.v. to lift rolls of paper on to and off machine; assists machine printer (wallpaper) generally. distributes printed sheets to workers for folding, perforating, etc., and collects work when finished; assists women staff in heavy manual work, e.g. lifting heavy packages; may also count or check numbers of sheets or forms, pack and label parcels for despatch; cf. bench hand (942). pastes or inserts carbon paper sheets in manifold books. a labourer who carries rolls of paper, etc. in various sections of wallpaper factory. keeps account of reels of paper used, and of pieces of wallpaper produced. a checker (printer's) q.v. who checks the numbers of bank notes. overlooks work of numberer (bookbinder's) q.v. to ensure that no blanks are left. brushes off, from case, surplus gold not impressed by stamp in gold blocking. checks work of gatherers q.v. and sees that pages, illustrations, etc., are in correct order. fills mixing vats and does odd jobs in colour shop. carries formes and type from one department to another, and acts as messenger for composing room. removes, by hand, surplus bronze from parts of sheet which have not been sized. places sheet of paper or card on plate of power-driven eyeletting machine, and operates foot lever which causes plunger to be brought into contact with paper or card and automatically punch hole and fix metal eyelet therein. (ii) see folding machine feeder. a folder (printer's) q.v. specially skilled in folding music. feeds printed sheets into folding machine so that edges are in contact with guides at front and side, or so that small holes perforated in sheet at time of printing are placed over steel points on feeding hoard of folding machine; starts and stops machine; removes stack of folded sheets from hopper. adjusts and supervises working of folding machines. arranges folded sections of pamphlet or book in order, usually by "signatures," or marks at foot of page, so that pages run consecutively. applies gum to back of books, by machine or brush; also gums edge of illustration pages etc. for insertion in books. applies gum acid, to etch stone, after design has been transferred, using a broad flat-backed brush. (ii) feeds machine with paper to be gummed or takes it off as it comes out at other end. prints hat tip with size before gold leaf or bronze dust is applied by hat tip printer (537) q.v. ; cf. bronze letter printer (538). evens up pile of printed sheets, before cutting them in guillotine cutter, by knocking side and ends on table or other flat surface; usually done by guillotine cutter (548) q.v. himself. feeds tin plates into lacquering machine, which applies varnish to them by means of rollers. assists linotype operator (523) q.v. by carrying away type when completed, melting up used type metal, etc. sweeps up machine room; fetches supplies of paper; carries away paper from machine, etc. a numberer q.v. specially skilled in numbering bank notes. numbers pages in book, tickets, cheques, etc. ; operates by means of handle or treadle, machine which automatically changes number after each impression; places paper so that number comes in right position; takes care that numbers run consecutively and adjusts it when additional figure becomes necessary. a numberer q.v. specially skilled in numbering cheques. works small hand stamp which applies identification mark to back of roll or piece. greases machines, and attends to their smooth running generally. 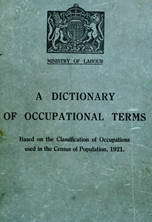 a printer's labourer q.v. who oils mill gearing and rotary machines in newspaper offices; sometimes done by brake hand (530) q.v. fixes, by glueing at front and end of book, strong paper, called "end-paper" or "waste paper," by which book is afterwards pasted to its covers; sometimes also acts as forwarder (532) q.v. fastens, by hand with paste, edges of end-papers in front and back of book, and does other pasting work required in bookbinding. feeds sheets into perforating machine, which perforates paper by means of revolving toothed wheel. pastes maps and plates in books. receives paper at taking off end of wallpaper printing machine, and folds or plaits it in a file preparatory to rolling it. a folding machine feeder q.v. who obtains "register " by laying sheet so that holes pierced in it by press points in printing machine fall exactly on points in folding machine; cf. pointer (530). feeds with books and, by means of hand lever, operates hydraulic press which presses out sponginess from books after folding and sewing; removes books after pressing. places thick hot iron plates at intervals between printed sheets, and lays between glazed boards in screw or hydraulic press, thereby removing indentations caused by type in printing and giving paper a perfectly smooth surface; cf. not presser (518). fetches and carries for pressman (548) q.v. does any odd jobs in or about printing office; sweeps rooms, runs errands, and acts as general shop boy. does various odd jobs of an unskilled character in or about printing office. breaks up books into sections preparatory to re-binding. attends to reeling of coated paper, when dry, from festoon-carrying rods of paper coating machine; sets empty spindle in reeling machine and removes it when full; controls reeling machine by means of levers; keeps laps on festoons straight, between coating and reeling machines; carries empty rods from reeling end to coating machine end of drying span between machines. attends to lines or festoons of paper at back of printing, grounding or varnishing machine, and to reeling of paper. changes copper rollers of wall paper printing machine. reeds machine which winds strip tickets, after they have been printed and perforated, into thick rolls ready for use. attends to rolling machine, which winds paper from reels on to rapidly revolving steel tod; stops machine, when a mark appears in margin, and cuts off paper. sews backs of pamphlets by hand, or by machine, after cutting holes along back with small saw. examines rolls of wallpaper to discover defects. fastens backs of pamphlets by means of wire stitching machine, which passes wire through sheets and presses ends flat. lifts lithographic stones in and out of presses or machines. runs string through showcards after eyeletting. hangs paper in long festoons from drying rods after it has been printed by block printer (535) q.v. ; lifts rod on to rails with a long-handled T shaped implement; sometimes also spreads colours on "sieve" for block printer. returns type to case, from which it came, after printing has been done; usually done by compositor (522) q.v. passes printed sheets into varnishing machine. washes blue prints immediately after printing in long tanks containing running water. washes off films from used photographic negatives with nitric acid, or cleans new glass in same way; rinses with water and leaves to dry, glass then being ready for coating, or recoating, with sensitised solution. washes rollers from printing machine, or blocks used by block printer, in water and chemicals, after printing has been done, using brushes, etc. (ii) cleans soiled parts of books before finishing process begins, washing off stains, removing superfluous glue, erasing fingermarks, etc. re-reels finished wallpaper into small rolls of suitable length for sale.